The styles of food you can cook are very versatile as well. Traditional American “meat and potatoes” type meals as well more ethnic foods like curry and asian cuisine are possible as well. Add lots of water for a stew, make some bbq chicken, or prepare for making pulled pork sandwiches. Oh man, now I'm getting hungry. A little known advantage of slow cookers is that they are great for the gluten free diet as well. One of the biggest deterrents to maintaining a gluten-free diet is the time it takes to prepare an allergen-free meal. Cooking from scratch can be a great way to avoid hidden glutens, but not everyone is interested in–or capable of–spending hours in the kitchen on a daily basis. Thankfully, using a slow cooker can simplify your meal prep by decreasing the time and effort you have to put forth in order to have a nice, warm meal waiting for you. 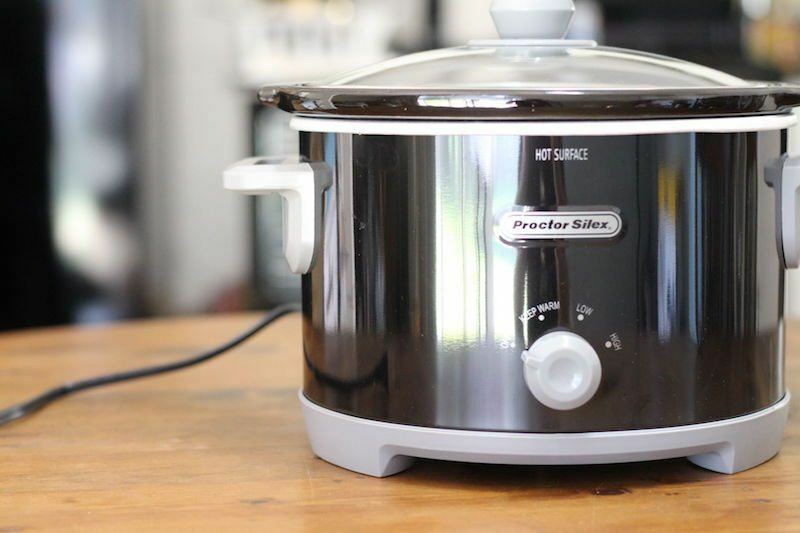 If you’re on a tight budget or not sure how much you’re actually going to use a slow cooker, you may be inclined to buy a basic appliance that gets the job done without breaking the bank. Taking into account cost, size, features and consumer reviews, we compiled this Top-5 list of affordable countertop cookers. We've chosen a price of under thirty dollars for this list, and we'll be publishing more price tiers soon! If you want to upgrade to a higher tier of quality, read our post on the top five 2-4 mid-priced quart slow cookers. In our reviews below, you’ll see a rundown of each model we like and then a concluding recommendation for our top pick overall. Be sure to let us know what your favorite is or what you plan to buy and how it works out in the comment section! 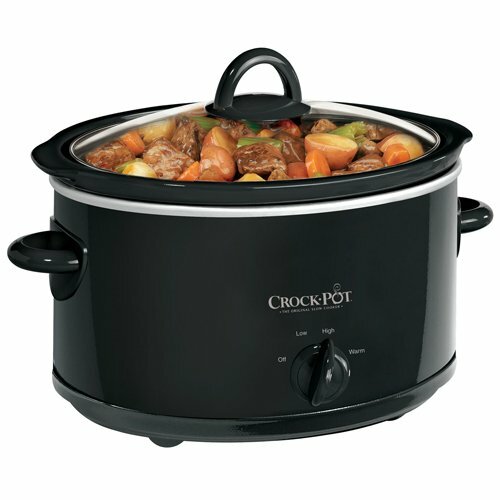 Easily serving a party of four or more depending on the meal or side you’re dishing up, this oval Crock-Pot has two cooking settings–high and low–along with the additional setting of warm, which can be used for up to four hours to keep your food at a palatable temperature while guests trickle in. The removable stoneware crock and the glass lid are both dishwasher safe. This particular model comes in a stylish shade of red and stainless steel, but they do cost a bit more. It also has many favorable reviews – currently almost 1,000! However, a minority of users have complained that there are gaps in between the lid and crock, which may cause hot liquid to squirt up or food to dry out. If you want a budget-friendly product from the original brand of slow cookers, this model is for you–especially if you need more cooking space than is provided by the two-and-a-half-quart alternative. 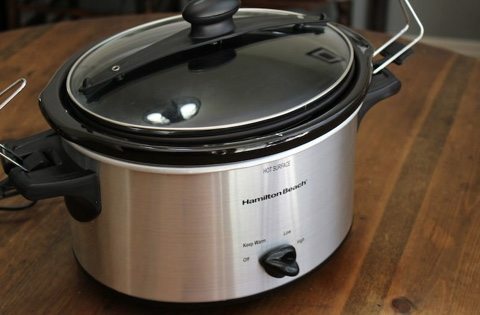 This bargain slow cooker from Hamilton Beach is equipped with three settings–low, high and keep warm. The black-and-silver appliance also features full-grip handles for easy carrying as well as a clip-tight sealed lid, which provides spill resistance when you’re transporting your food-filled cooker to a community potluck or family reunion. The removable insert is made out of stoneware and is dishwasher safe. Unlike some other Hamilton Beach models, the Stay or Go product is extremely affordable and travel friendly. Users have put the manufacturer’s “no-spill” claims to the test and are pleased with the positive results. 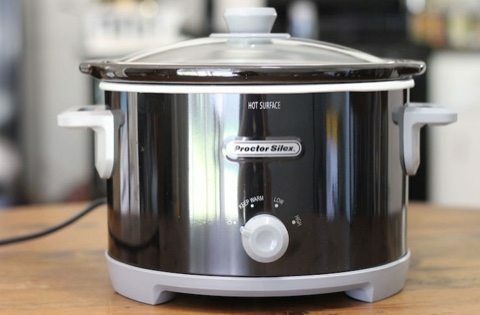 Unfortunately, some customers have found that this appliance heats dishes more quickly than other slow cookers, which means you may want to try out a new recipe on a day when you can periodically check on your food as opposed to a day where you’ll be away from the house for a full eight or ten hours. Since the four-quart size pot is perfect for a four-pound chicken or two-pound roast, this model is ideal for someone who’s feeding a small family or who enjoys eating some leftovers. 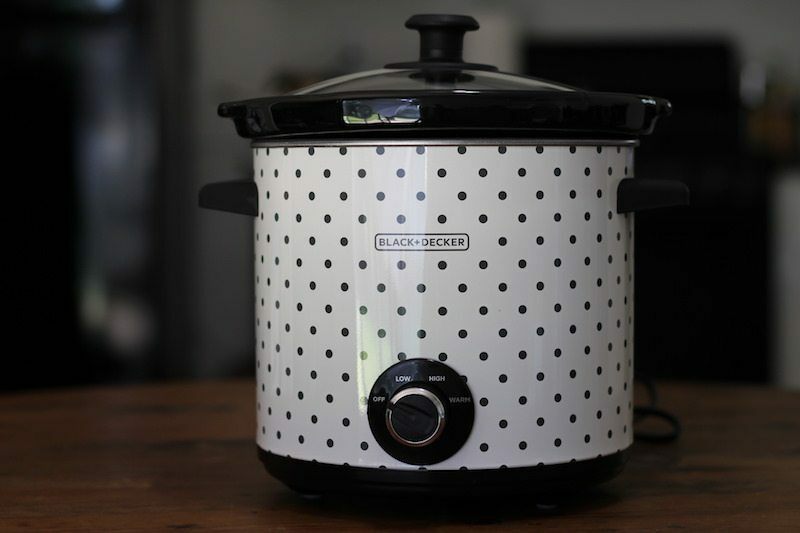 This Black & Decker cooker is round, which has its pros and cons: some meats might sit better in an oval crock while other dishes may benefit from being cooked on a narrower base. Also, the walls of this unit are on the thin side so you’ll want to make sure nothing is near your appliance when it’s plugged in. That being said, if you want a cutesy cooker to brighten up your countertop, and if you plan on using it with care, this fun product ought to serve you well. Priced at under twenty bucks, this durable slow cooker is a steal of a deal. You can adjust the settings from high to low to keep warm based on your needs. And, both the removable stoneware insert and the glass lid can go in the dishwasher for easy cleanup. There aren’t any bells or whistles to fawn over, but Proctor Silex has been making reliable appliances for over fifty years. 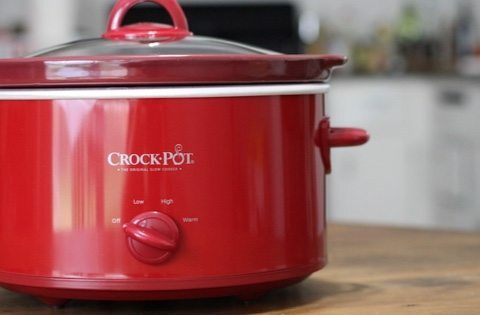 The company doesn’t make a larger-sized crock so if you’re in the market for a low-cost cooker that can still deliver a family meal, this product is a great choice. This Brentwood appliance has a stainless steel body, a ceramic removable pot and a tempered glass lid. There are three heat settings–high, low and auto–as well as an LED power indicator, which easily helps you see if the cooker is in use. The round product also features cool-touch handles to help keep you safe. Having a capacity of three quarts, this budget appliance isn’t something you’d use to serve a houseful of guests, but it can definitely serve couples or singles. If you make small meals and love the idea of having a lit-up power indicator, snag this product right away. After all, the LED feature is hard to come by at this price point. 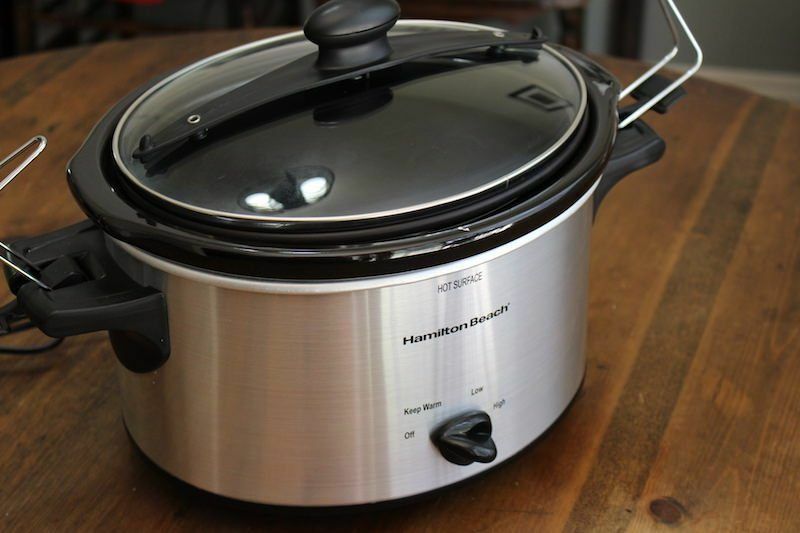 Overall, the Crock Pot Oval Manual Slow Cooker is our top pick. For under thirty dollars, this four-quart appliance delivers a lot of value. The design isn’t flashy and the three-setting dial isn’t technologically forward, but the price is right, the capacity is nice and the portability is amazing. Plus, Crock Pot is one of the most trusted brands in the industry! Our #2 pick was the Proctor Silex 4 Quart. Who can beat a price like that? We already tested it and love it. 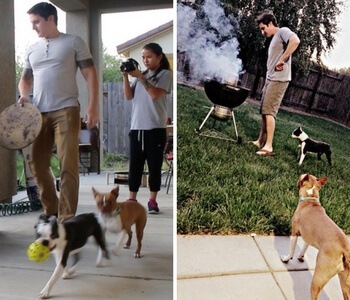 It's great for someone on a budget with a extra small kitchen. 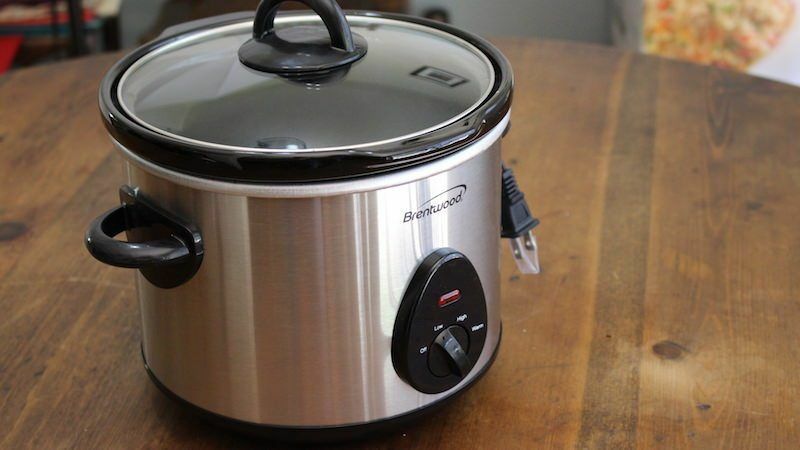 We also liked the Hamilton Beach one, which was quite similar to the Crock Pot model, but was more expensive, and came with travel hooks that we didn't need. It also has a rubber gasket, which tends to get smelly over time and can affect the flavor of lighter flavored dishes. When it comes to cooking gluten-free meals at home, you don’t need fancy, high-priced equipment in order to eat well. Buying a basic slow cooker is a great way to get the most bang for your buck. Whether you’re planning on cooking meats, stews, soups or a variety of other dishes, we hope this review list helps take the guesswork out of what could otherwise be a tedious shopping process. Of course, when you’re buying ingredients for your slow-cooked dinners, remember to read all of the ingredient labels. If you want a store-bought marinade to flavor your chicken or a manufactured blend of spices to season your soup, make sure there are no hidden glutens contained in such picks. With a little bit of effort beforehand, you can make sure that you’re putting scrumptious yet safe foods into your body.